While Roman soldiers stationed at the northern front of the empire and Hadrian’s Wall did battle to stave off attacks from “barbarian” tribes, they were also doing battle with a smaller, less obvious foe: those devious creatures now commonly known as head lice. 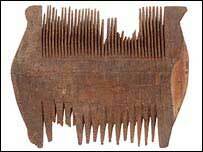 An excavation outside of Carlisle Castle in Cumbia revealed an ancient soldier’s haircomb, excellently preserved and including a fully intact, 3mm long louse. 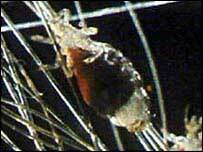 Based on stratigraphy, the comb and louse are about 2,000 years old! The Roman fort of Luguvalium, an ancient site located near Carlisle Castle, was founded around 72-73 AD to help defend the Roman Empire’s border along Hadrian’s Wall. Since the Roman ground layers where the comb and louse were found is largely waterlogged, it’s quite the feat that both these items survived until present day. Thousands of additional artifacts were also found at the site, but the louse was among the most intriguing – according to site archaeologist Carol Allen, the louse is one of the largest and more complete examples of the creature ever found in the Roman world. Along with pieces of wood and textile that normally don’t survive in this environment, it is hoped that the louse and assorted items will help to shed some light on what it was like to live inside a Roman fort in the 1st century AD. Unfortunately for the people who once lived there, at first glance it now appears as though the situation was less than hygenically ideal. For the record, it is already known that lice have been around for hundreds of thousands of years, though complete ancient specimens such as the one found inside the Roman comb are rare, if not nonexistent in most parts of the world. However, it’s worth noting that the treatment of head lice has not changed much since ancient times – take a look at the ancient Egyptian louse comb and the modern louse comb pictured above.